Assimilation or preserving own culture? ...The years, after all, have a kind of emptiness when we spend too many of them on a foreign shore... Between two countries, we have none at all, or only that little space of either, in which we finally lay down our discontented bones. Nathaniel Hawthorne, in Zofrea, 1992, p.5 [pages not numbered]. Lithuania is a small country in central Europe, wedged in between Germany, Poland and Russia. It has a 99 km coastline along the South-Eastern elbow of the Baltic Sea. Lithuania’s total land area is 65,200 sq km – similar to that of Tasmania (Lithuania, 1991, p.9). However, Lithuania is populated much more densely: its present population is about 3.5 million. Lithuanians speak an ancient Indo-European tongue, which is similar to modern Latvian. Viewed more broadly, Lithuanian is related to Ancient Greek, Latin and Sanskrit, the oldest known member of the Indo-European family (Skardzius et al., 1950, p.25). "Lithuanian history thus begins with a fight for freedom in the thirteenth century, and it continues as a national struggle for 750 years…[It] is a kind of miracle. Down to the beginning of the 20th century there can never have been more than two million Lithuanians at most. Somehow they have managed to survive as a nation for almost eight centuries in their Baltic homeland, surrounded by and fought over by immensely powerful neighbours – among them the Poles, the Germans and the Russians." Jogaila (or Jagiello), the Grand Duke of Lithuania, married Jadwiga, the Queen of Poland in 1366. This partnership of the two states lasted for over 400 years: as a personal royal union at first and then as a formal Commonwealth, confirmed in the city of Lublin in 1569. Lithuania was not subordinated to Poland: Lithuania remained a separate political unit, with its own ruler, courts, its own laws, institutions and a separate army. In the late 18th century, however, the Lithuanian-Polish Commonwealth was usurped and partitioned thrice by the alliance of Russia, Austria and Prussia. After the third partition in 1795, Russia took over most of Lithuania. Indigenous Lithuanians and their Polish neighbours rebelled jointly against the Russian rule in 1830-31 and again in 1863, but were defeated on both occasions. Russian authorities reacted cruelly: many rebels were executed, others were deported to Siberia. Some escaped and later made significant contributions to their new host countries (e.g., Domeyko to Chile’s education, Gielgud’s offspring to the British theatre). The University of Vilnius was closed after the 1830-31 rebellion. All Lithuanian publications were banned after the second uprising in 1863 (Gerutis, 1984, pp.119-131). Emigration from Lithuania increased during the 19th century, for more than one reason. Some Lithuanians were escaping punishment for anti-Russian resistance. Some conscientious objectors wanted to avoid being forced into the Russian army, to serve for lengthy terms, ranging between 6 and 15 years or more. Others were economic migrants, seeking better living conditions or money to buy land back home. While some Lithuanians migrated to Prussia, or to other West European countries and to Britain, some other Lithuanians went overseas. By the end of the century, it was estimated that 200,000 Lithuanians were living in East Prussia, under German rule; and at least 700,000 had migrated to the United States (Rose, 1992, p.15). A proportion of the latter arrivals lacked elementary education. For example, 177,166 out of the 252,594 (70%) Lithuanian immigrants from the first wave could not read or write (Van Reenan, 1992, p.51). Back in Lithuania, a new wave of national awakening sprang up, and kept growing in intensity. It combined many factors: national awareness, a break away from the Polish culture, a drive for autonomy, the end of serfdom, better education for the masses, a new Lithuanian spirit in religion and a campaign for abstinence (Vardys & Sedaitis, 1997, pp.16-23). Eventually, this led to the restoration of Lithuania’s independence on 16 February 1918. The economy was gradually built up and the cultural life flourished (Kelertas, 1990). Lithuania lost its sovereignty twenty-two years later, when Russia occupied the country on 15 June 1940. Another foreign takeover, namely, the German occupation, followed from mid-1941 to 1944. Then, Russia came back to rule again for another 46 years. Lithuania’s independence was finally restored on 11 March 1990 (Kelertas, 1992; Ashbourne, 1999, passim). Demographic evidence has estimated (Damusis, 1998, p.275) that, between 1940 and 1959, ruthless German and Russian rulers were responsible for the deaths of 683,185 citizens of Lithuania, or 22.17% of Lithuania’s pre-war population. Another 10.38% of Lithuania’s residents had migrated, repatriated or fled to other countries. Some refugees died en route, some died in air raids from both sides. Some of the refugees who had managed to reach Sweden were not allowed to stay and were sent back to Lithuania by force, only to be re-directed to Siberia (cf. One of the betrayed, 1986, Baltic News, XII, (2), 2). In Australia, Lithuanians have always been a tiny minority: they have never approached even 0.01% of Australia’s total population. However, their impact on the Australian culture has been far greater than their numbers suggest. A few Lithuanian migrants started trickling into Australia 170 years ago, but most of the earlier information is sketchy and anecdotal. The first Lithuanians known to come to Australia arrived in 1833. They were refugees who had got away after the unsuccessful insurrection of 1831, while many participants and supporters of the revolt in Lithuania were caught and exiled to Siberia. Those who escaped to Prussia were interned because Prussia was part of the Russian-Austrian-Prussian Alliance. However, some of the internees were allowed to move on from Prussia to France and to other West European countries (Montes, 1987, p.23). The remaining refugees were deported to England. Some of the latter fugitives, such as the ancestors of Sir John Gielgud (Gelgaudas), settled in Britain (Gregg, 1997, p.17). Some travelled on to France, and a few ventured as far as Australia. Some early Lithuanian migrants had resettled from England to Australia during the 19th century, but nothing further is known about them. A few decades later, a club of Lithuanian glass factory workers existed in Adelaide in 1888. There was a Lithuanian farmers’ colony near Brisbane, for a while (Suziedelis, 1970, p.222). In Sydney, the Australian Lithuanian Society was organised after World War I and it had about 100 members in 1929 (Bauziene, 1996, p.33). One hundred and eighty-seven persons were evacuated from the three Baltic States (Lithuania, Latvia and Estonia) in October 1940 and arrived in Brisbane two months later, in December 1940. They held British passports, but some were ethnic Lithuanians who had lived all their lives in Europe and spoke no English. They fled from the Soviet invasion of their home country and undertook a long journey via the Trans-Siberian Railway and Vladivostok to reach Queensland (Wicks, 2002; Lapas, January 2002, p.2). It was not until the late 1940s and early 1950s that larger numbers, i.e., approximately 10,000 Lithuanian migrants, came to Australia. Most of them were refugees, who had fled from Lithuania in or around 1944, to escape the second Soviet occupation of their country (1944-1990). They will be referred to here as the post-war immigrants. These immigrants initially saw Australia as a temporary stopover, because they were hoping to return home soon. Their hopes were not fulfilled (Straukas, 1983, pp.12-15; Martin, 1965; Dunsdorfs, 1975, pp. 27-36). Most post-war Lithuanian immigrants came to Australia as indentured labour; that is, every migrant over the age of 18 had to enter into a two year contract with the Australian government which obliged the migrant to work wherever directed. The contracts were strictly enforced, even if it meant that families were split up (Klaassen, 1997, pp.157-158). On completion of their Government contracts, the Lithuanian arrivals remained spread across the continent: Sydney 2,500; Melbourne 1,500; Adelaide 1,200; and smaller numbers in hundreds of other locations (Metrastis I, 1961, p.56). Some, unable to work in their professions or having found the climate too trying, went overseas. According to some sources, up to 2,000 re-settled in the U.S.A. (Metrastis I, 1961, p.56). Smaller numbers went back to Germany, and to several other countries, to live permanently. The reasons for this significant exodus have not been researched or documented systematically. It is known, however, that numerous qualified Lithuanian immigrants were unable to gain due recognition and acceptance of their capacities and training in Australia (Mitchell, Tait & Castles, 1990, passim). Many of these transferred to other countries where their qualifications were recognized. By 1996, the number of Lithuanians in Australia had dwindled down from 10,000 to 4,222, i.e., 0.00024% of the total Australian population of 17,752,882 (Potts, 2001, pers. comm., 24 January). Apart from the re-settlement just mentioned, the drop in numbers was caused by two further factors: natural deaths and the reluctance by some members of the second generation to register as Lithuanians (Doniela, 2002, pers. comm., 22 April). Australian research has concluded (Dawkins et al., 1991) that the larger the existing stock of immigrants and the more recently arrived they are, the more such immigrants are likely to regroup and re-settle at new destinations within Australia. Selection of the new places of residence tends to be influenced by friends and family and by the availability of jobs. This was true of the Lithuanian immigrants: on completion of their initial two-year Government contracts, a large proportion of Lithuanians moved to the State capitals or other larger centres where they joined the Lithuanian communities there. There are very few Lithuanians in Tasmania, an Australian island state that happens to have approximately the same landmass as Lithuania (65,300 square kilometres). Between 40 and 100 Lithuanians live scattered throughout Tasmania now (2005) - an insufficient number to provide the backing and demand that would be needed for any conventional Lithuanian courses at the University of Tasmania. "…But the best thing about you Lithuanians is that on the street you are indistinguishable from ordinary Australians…and the worst…is that there are not enough of you." (Kazokas,1992, p.55). Lithuanian-language newspapers were initially required to print a quarter of their content in English. While intended to force migrants to learn their new language, this Government requirement was viewed as an imposition by the ethnic editors and their readers. It was a great pity, however, that the Lithuanian editors failed to see the other side of the coin: the English-language pages could have been (but were not) used to document the Lithuanian tragedy, in English and in great detail. The main Lithuanian-language newspapers in Australia are still being published now, although circulation keeps falling: weekly Musu Pastoge in Sydney and fortnightly Teviskes Aidai in Melbourne, supplemented by local bulletins in Adelaide and Brisbane. At the same time, Lithuanian communities are taking advantage of modern technology. Weekly Lithuanian broadcasts are transmitted across Australia, through the SBS networks. Internet websites have been established in Sydney and Brisbane, with more expected to follow in other centres. Unlike the "guest-workers" in Europe, the migrants arriving in Australia after the Second World War were expected by the Australian Government to settle permanently and to assimilate. This explicit policy was highlighted by the creation, in 1947, of the Assimilation Branch of the Australian Department of Immigration (Ozolins, 1993, p.10). Assimilation meant blending into the Australian monoculture, "with everyone living in the same way...and sharing the same aspirations" (Snedden, quoted in Ozolins, 1993, p.104). This official attitude was supported by many "old Australians" understandable determination to retain their traditional Australian identity, even though such identity was difficult to define (cf. Carrol, 1992, especially J. Hurst's article). Richard Boyer, the chairman of the ABC, complained in 1956 that, when "invited by a group of new Australians to tell them what the Australian way of life was", he found "putting it into words was one of the hardest tasks that ... [he had] ever faced". (Ozolins, 1993, p.41). Efforts to assimilate the newcomers quickly were not confined to government officials. English-born Lithuanian priest Rev Jonas Tamulis had ministered to the early immigrants in Bathurst and Sydney in 1948–50. When he went on a visit to the United States in 1950, Rev Tamulis was informed by Mgr C.M. Grennan, Secretary of the Australian Catholic Immigration Committee, that he would not be allowed to return to his chaplaincy in Sydney, but would be posted to Perth instead. Rev Tamulis remained in the United States (Metrastis I, 1961, p.98). It was subsequently ascertained that the church authorities did not like Rev Tamulis’ "daring" plan to follow the American example and establish a nationality-based (Lithuanian) parish in Sydney (Metrastis I, 1961, p. 114). The migrants' own views on assimilation and ethnic future have varied considerably. They seem to be linked to the newcomers' original motives for migration to Australia. Giedre van den Dungen's study (1996), which looked at the Lithuanian migrants in the U.S., has many parallels for Australia. Political refugees - such as the Lithuanians - often feel a two-fold responsibility toward their old country: cultural and political (Boas, 1999; Putnins, 1986, p.82). Cultural responsibility means preserving all their cultural attributes in Australia, lest they are obliterated or significantly altered by the regime in their home country. Political responsibility entails providing a voice to warn the world about the fate suffered by their homeland. International research has shown that some measure of assimilation is inevitable for any ethnic community. Even seemingly airtight and isolated colonies, such as the Amish or Hasidic Jews, cannot totally escape a slight touch of assimilation (Wolkovich-Valkavicius, 1988, p.82). Furthermore, assimilation is a two-way process. As an immigrant absorbs the culture of his host country, he is also giving off and surrendering some of his own imported heritage. As a result, a Lithuanian living in Australia for a long time is likely to gradually create a new identity, although he may not be aware of it. What the former immigrant still believes to be his Lithuanian identity may well be regarded as totally Australian by the contemporary residents of Lithuania (van den Dungen, 1996, p.58; Pranauskas, 1998, pp.78-82; Bortkevic, 2001, passim). The obverse of assimilation, i.e., anti-assimilation, was discussed in the pre-war Lithuanian literature. Kazys Pakstas, a one-time professor of geography in Kaunas and later in the U.S., predicted correctly during the 1930s that Lithuania would be occupied by a foreign power. Pakstas advocated the creation of a “Reserve Lithuania” (Atsargine Lietuva) in Angola or British Honduras or at some other location (EL IV, 1975, pp.157-158). In this context, Pakstas laid down the rules for "countries fit and unfit for colonisation". If the Lithuanian culture were to be preserved in a foreign environment, Pakstas argued, Lithuanian colonisation would have to keep away from large cities, from monocultural countries, clusters of several thousand or more whites and from autocratic ecclesiastical powers. Pakstas favoured British colonies, but not British dominions, where the white race was not yet established, where there was sparse population with much free land and where “Lithuanian cultural elements could dominate” (Quoted in Van Reenan, 1990, pp.133-134). Pakstas also had a second proposal: to create a Lithuanian elite in the Diaspora. The general public and the Lithuanian governments of the day (1931-1938) showed little interest in Pakstas’s plans. (Van Reenan, 1990, p.134). Nonetheless, the Lithuanian post-war migrants who came to Australia and to other Western countries were behaving contrary to Pakstas’s prescriptions. As a result, it could be argued that they have left themselves open to unavoidable gradual assimilation. Apart from food, the average Australian seems to know very little about non-British migrants or their cultures. An attempt to preserve migrant cultures in Australia was initiated two and a half decades ago, on 30 May 1978, when the Report of the Review of Post-Arrival Programs and Services to Migrants was tabled in the Federal House of Representatives. Commonly known as the Galbally Report, the document recommended, inter alia, "that if our society develops multiculturalism through the broad concept of community education, it will gain much which has been lost to other nations" (Galbally, 1978, 9.8). This recommendation was based on the observation that "already our nation has been enriched by the artistic, intellectual and other attributes of migrant cultures" (Galbally, 1978, 9.8). Schools, ethnic affairs commissions and other community bodies, often buoyed by special-purpose Government funding, have since endeavoured to implement multicultural programs and greater ethnic awareness throughout Australia (Murphy, 1993, pp.246-248). More research remains to be done, to document the diverse cultures brought to Australia by migrants. Considerable data, so far unused, remain accumulated in ethnic libraries and in private collections, e.g., Lithuanian Library in North Melbourne and Lithuanian Archives in Adelaide. Apart from their ethnic value, these documents are also part of recent Australian history - sometimes obscured and sometimes-unknown altogether. Since, however, many of these source materials are written in ethnic languages, accessibility to them may be more difficult, especially if bilingualism is allowed to wane in Australia (Smolicz, 1992, pp.10-12). The initial two-year work contracts were the Lithuanian migrants’ first major contribution to Australia. They helped to solve an acute labour shortage in Australia, especially in outlying areas. Along with other European migrants, they "relieved the shortage of domestic staff in hospitals, increased the output of building material, helped to build Australian homes, saved fruit and sugar crops.., maintain(ed) railways.., work(ed) in sawmills, brick factories, cement works, on sewerage projects, water conservation, salt and brown coal mining, clearing land, quarrying, etc." (Dunsdorfs, 1975, p.29). At Wooroloo TB Sanatorium in Western Australia, the migrants solved a real crisis when the sanatorium staff had shrunk from 80 to 13. The sanatorium was on the point of turning away patients when 40 Baltic women were allotted to it and normal services were restored. At Gippsland Hospital, Victoria, 28 Balts made possible the opening of a new TB ward. In New South Wales, 60 Balts enabled hospitals to keep several wards open (Dunsdorfs, 1975, pp.29-30). A report by the Commonwealth Employment Service, dated September 1948, stated, "They [the first 4000 displaced persons] are everywhere employed upon work for which sufficient Australian labour is not available… This review of their activities over a very short period suggests how much impetus their availability in large numbers is likely to give to our housing program and to our production in other industries which are vital to the Australian economy." (Dunsdorfs, 1975, p.30). The fair-skinned Lithuanians and other European arrivals were seen as a tangible response to the popular call of the day, to "populate or perish". Their presence helped to allay the Australian population’s fears of "the yellow hordes in the north" (Klaasen, 1997, p.155). When speaking of Lithuanian migrants’ contribution to Australia, the politicians and others usually emphasise the newcomers’ economic impact. This is true, but is only a part of the full story. On arrival in this country, the 10,000 Lithuanians had joined other migrants in the rebuilding of Australia’s capital structures that were to serve the nation for many decades to come. The same migrants could have accomplished a great deal more, if the Australian authorities had made full use of their skills and knowledge, instead of treating them all as unskilled labour (Marginson, 1997a, p.17). Nevertheless, their economic contribution was significant at a time when Australia needed it most. Did Lithuanian migrants take away jobs from "old" Australians? This accusation is levelled from time to time, not only at the Lithuanians, but also at all migrants. It may be true in some cases, under certain circumstances; but it can hardly be applied to the Lithuanian migrants in this country. The author’s preliminary estimates suggest that the 10,000 Lithuanians who came to Australia have created at least 11,000 jobs. After completion of their two-year contracts, many newcomers established building companies, new factories, retail shops, service and repair centres; skating rinks, tailor shops and even a complete town (Eucla). Many other Lithuanians became self-employed in small business and in all kinds of trades. For example: Mr Gediminas Rakauskas founded a chain of construction and plant hire companies in South Australia and Northern Territory between 1958 and 1969. He employed an average of 300 tradesmen, administrators and labourers, and another 150 sub-contractors, at the peak of his career. In this case, one Lithuanian migrant had created and sustained 450 jobs in all (Rakauskas, 1999b, pers. comm., 19 September). Likewise, Messrs Antanas Ceicys and Vytautas Genys started ACT Builders Pty. Ltd. in Canberra in a small way and with very little capital. By 1961, they were employing nearly 200 workers (Metrastis I, 1961, pp.286-287). As a group, the newly arrived Lithuanian migrants created additional secondary jobs, with their high levels of demand for goods and services (DIMA, 1998, p.19). It is beyond the scope of this article to pursue the topic further. It is worth noting, however, that, while a great deal of research has been carried out in Australia over the past 40 years on the general economics of immigration (cf. Joske, 1989), nothing of substance has been published to date on the specifics of Lithuanian immigrants and their particular contribution. The Lithuanian immigrants have strengthened Australia in several other ways. Research at the University of Tasmania (Kazokas, 1992) has shown that the comparatively small intake of 10,000 Lithuanian migrants has given Australia 137 artists. Many of these artists have gradually moved to the forefront of Australian sculpture, painting, photography and other fields of creative arts. Lithuanians played an important role in the Contemporary Art Society of Australia and in new art movements such as the Centre Five in Melbourne and the Vanguard group in Sydney. Lithuanian art lecturers and teachers have influenced new generations of Australian artists: at least 28 Lithuanians are known to have worked in art education in this country (listed in Kazokas, 1992, p.372). While the mainstream Lithuanian literature continued developing under the Soviet rule (Kelertas, 1992), expatriate Lithuanian-language writers in Australia branched out with their own work, e.g., Pulgis Andriusis, Viktoras Baltutis, Juozas Almis Juragis, Kazimieras Kaminskas, Vincas Kazokas, Agne Luksyte, Marija Elena Siliute-Malakuniene, Juozas Mikstas, Brone Mockunas, Petras Pilka, Pranas Pusdesris, Ava Saudargas, Julija Svabaite, Aldona Vesciunaite, Bronius Zalys, Albertas Zubras-Zemribas. An ever growing group of other, partly second generation Lithuanians appeared on the Australian literary scene, with their work written either in English or bilingually, e.g., Milda Dulhunty, Jurgis Janavicius, Elena Jonaitis, Lidija Simkus, Vincent Taskunas, Jurate Vitkunaite-Reilly, Egle Zizyte-Garrick (Mycak, 1997, pp. 34-35). At least 25 volumes of Australian Lithuanian poetry were published up to 1989 (Juragis, 1989, p. 4). This accumulated cultural treasure has never been translated into English and it is doubtful, whether it will be opened up to the Australian readers in future. This is a great pity because Australian Lithuanian poets have written in depth on many themes, including their new home, Australia. "You are homeless in your country, like me. "And you beg Heaven for freedom, maybe..."
The following ballet dancers of Lithuanian origin danced in leading Australian companies: Ramona Ratas - The Elizabethan Opera Ballet Company (1957), Borovansky Ballet (1959-61) and foundation member of the Australian Ballet (1962), including the Ballet’s first overseas world tour (6 months, 1965-66); Regina Plokstis - Borovansky Ballet (1959-61); Joseph Janusaitis - Australian Ballet (1966-82); Sally Wicks (Puodziunas) - Sydney Dance Company (1995-2002). Janina Cunovas (also known as Ciunovas and Ciunoviene) was a renowned ballet teacher in Australia and overseas. In 1996, she was named one of the world’s best ten ballet teachers (Ward Warren, 1996). Gifted Lithuanian musicians like Povilas Matiukas (violin, Adelaide) and Motekaitis (cello, Sydney) were invited to join Australia’s leading symphony orchestras - but only after they had survived their two years’ manual labouring contracts, working away from active music making. Pianist Irena Vilnonis received early recognition in Newcastle and Sydney; she later went on to win the ABC Piano and Vocal Competition in 1958 (Metrastis I, 1961, p.282). Lithuanian theatres were formed in several larger centres. In the absence of funds or outside sponsorships, their continued existence depended on everyone’s voluntary labour, on the availability of experienced producers and suitable plays, etc. Nevertheless, the Lithuanian theatres in Australia were another mirror of these immigrants’ rich intellectual contribution. Especially in the larger centres, Lithuanian migrants continued to preserve their culture with folk-dancing groups, choirs, traditional instrumental music and folk crafts. The Lithuanians have a very rich heritage of folklore: about 200,000 folk songs alone are known to have been recorded. Lithuanians sing spontaneously in four parts: youngsters learn harmonising from their mothers at a very young age (Rakauskas, 1991, p.8). Every two years since 1960, Australian Lithuanians have been staging a festival known as the Lithuanian Days, previously known as the Australian Lithuanian Days of Arts. The program usually spans a week, between Christmas and the New Year’s Day, and is held in turn in one of the larger centres, such as Melbourne, Sydney, Adelaide, Canberra, Geelong. The Lithuanian Days provide the forum to the various folk-dancing groups, choirs, and theatres. Art exhibitions are held. Various Australia-wide organizations meet. The Lithuanian Days have always had a significant influence on the Lithuanian cultural life in Australia. They provide the best opportunity for people to come together, mix and exchange ideas. Australian Lithuanians have not kept these cultural treasures to themselves: they shared them with anyone who wanted to join in. 80% of the dancers in the Hobart Lithuanian folk dancing group in the 1970s were Australians of British stock. For many years, there was an all-Australian choir in Launceston singing a wide repertoire of Lithuanian songs, under the direction of Jonas Krutulis (Taskunas, 2005). The multicultural choir of Geelong is an extension of the local Lithuanian choir and is conducted by the same Lithuanian conductor. On the last Monday night before Easter every year, there is an open heritage workshop at the University of Tasmania, demonstrating the traditional Lithuanian art of colouring and decorating Easter eggs. This is not a closed night just for the ethnics: it is an example of the Lithuanians sharing their heritage with everyone. Lithuania is not a wealthy country. To survive among forests and lakes, the Lithuanians had to practise environmental protection as an essential way of life. After arrival in Australia, they passed on their love of nature. One of these natural Lithuanian environmentalists was Olegas Truchanas, known for his exploration of South-West Tasmania and for his beautiful photographs of Tasmania (Angus, 1975). Lithuanian migrants have greatly valued education and training. They are said to have sent more children to higher education and trades than the national average (Martin, 1971, pp.100-101). Unfortunately, no comprehensive data are available so far, because no follow up research has been done or encouraged in this area relating particularly to the Lithuanians, since the early 1970s. It is known, however, that at least 30 persons with Lithuanian names have graduated from just one Australian university, the University of Tasmania (Lithuanian Papers, 1997, p.66). Many Lithuanian migrants have entered professions, mostly after years of arduous study and sacrifice. Some of the doctors, dentists, lawyers and others whose qualifications were not recognised in Australia, went back to universities here and qualified again. Some laboured during the day and studied at night. In some families, wives worked long hours, while husbands studied full-time; or vice versa (Metrastis I, 1961, p.267). Some other Lithuanian immigrants continued working well below the level of their training, while some became self-employed in new fields. In Geelong, for example, an experienced Lithuanian doctor was not allowed to practise and opened a successful grocer’s business instead (Metrastis I, 1961, p.285). In Perth, another Lithuanian doctor retrained and became a pharmacist. A number of former Lithuanian migrants have since risen to academic positions in Australian universities and research establishments (e.g., Helmutas Bakaitis (Drama Production/N.I.D.A., UNSW), Kristina Brazaitis (German/University of Melbourne), Zigmas Budrikis (Electrical Engineering/UWA), Aldona Butkus (Physiology/Howard Florey Institute, Melbourne), Paul Cetkauskas-Cleveland (Media and Industrial Design/RMIT & Holmesglen TAFE), Vytautas Doniela (Philosophy/ University of Newcastle), Bianka Francas (German and Science Languages/UWA), G. Grudzinskas (Medicine/University of Sydney), Algirdas Ivinskis (Psychology/University of Newcastle), Eric Janciauskas [Jankauskas?] (Mechanical Engineering/James Cook University), †Vincas Jomantas (Sculpture/RMIT), Algimantas Kabaila (Civil Engineering/UNSW), Paul Kabaila (Statistics/La Trobe), Danius Kairaitis (Chemistry/U.T.Sydney), Gintaras Kantvilas (Botany/Tasmanian Herbarium), Sidsel Veronika L. Kristensen (Art/Newcastle CAE), Daiva Labutyte-Bieri (Physiotherapy/University of Sydney), †Jonas Meiliunas jnr. (Sociology Coburg CAE), Rimta Nakutis (Economics/University of Newcastle), Ieva Pociene (Art/University of S.A.), Kestutis Protas (Chemistry/Granville TAFE), Algimantas Taskunas (Government/ University of Tasmania), Ramutis Zakarevicius (Electrical Engineering/ UNSW), Aldona Zakarauskas-O’Brien (Painting/Newcastle CAE), †Teisutis Zikaras (Sculpture/RMIT), Chris Zvirblis (Electrical Engineering/ Northern Sydney Institute TAFE). Some of these academics have since retired; several are deceased (†). Lithuanian sportspeople have represented Australia at the Olympic Games and in other important events, e.g., Algis Ignatavicius, Stasys Darginavicius (both played basketball for Australia in the 1956 Melbourne Olympics), E. Palubinskas (Munich, Montreal); Antanas Andrikonis, Aldona Snarskyte - table tennis; Tabitha Andriunas - swimming, Pranas Mikulicius – middleweight boxing (S. Taskunas, 1996, p.18). Most Lithuanian immigrants have become Australian citizens, and have proven they to be loyal members of the Australian society. They have a very low crime rate (Clyne, 1982). They have fought with the Australian forces in Korea and in Vietnam. Several Lithuanians have risen to important ranks in the Australian armed forces. Juozas Lukaitis is a Commander in the Royal Australian Navy Reserve. A number of Lithuanians have since been honoured with Australian and British decorations (see Appendix 5). The Lithuanian newcomers have shown a great love and attachment to their newfound home. In Wollongong, steelworks employee and art collector Bronius (Bob) Sredersas donated his valuable art collection to the State of New South Wales. The collection consisted of 88 paintings and collections of curios. 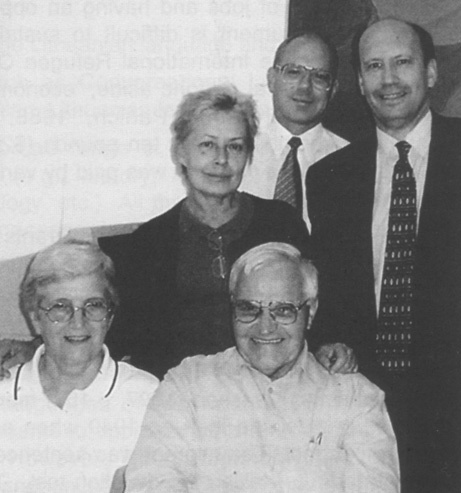 In 2000, the Sredersas collection was valued at $1.5 million; and it keeps appreciating (Pozelaite-Davis, 2005, p.3). At Lobethal, South Australia, Lithuanian migrant Jonas Vanagas researched the history of the early settlers in the town and district. He set up a municipal museum in 1956, of which he was later appointed curator. The museum was extended in 1961 (Metrastis I, 1961, pp.159, 208). Lithuanians are a self-sufficient migrant group. Long before the principle of "user pays" became fashionable in Australia, the Lithuanians chose to finance all their ethnic interests out of their own pockets. They acquired impressive Lithuanian houses, halls and museums in Melbourne, Geelong, Sydney, Brisbane and Perth; they built two Lithuanian Houses and a church in Adelaide. Each larger Lithuanian community in Australia has its own library, with the books paid for by the community members. Lithuanians are still footing the costs of publishing two weekly newspapers in Australia now, without any State or philanthropic subsidies. Unfortunately, fellow Australians did not always welcome these initiatives. When the Geelong Lithuanian community bought two blocks of land in 1950 to build a community hall, an article appeared in the local paper, protesting that this would "stop assimilation". Difficulties were experienced in obtaining a building permit for a "Lithuanian House" from the local authority, even after the original blocks of land were exchanged for new plots in another, non-residential area (Metrastis I, 1961, p.202). In the early years (1950s and 1960s), accommodation crisis was acute throughout Australia, and most migrants lacked the capital to set up their homes. In 1961, Melbourne Lithuanians formed their own credit co-operative Talka, to help with housing loans. The credit union’s staff worked for a nominal fee only. With the overhead costs kept low, Talka could pass the savings on to the borrowers and pay better interest to the investors. The annual profits were used to support various community projects and activities. Talka gradually grew and expanded to two other capital cities, Sydney and Adelaide (Straukas, 1983, p.20; Baltutis, 1983, pp.101-106). Lithuanians in this country also have their own Australian Lithuanian Foundation Inc. Its aims are to foster and financially support Lithuanian migrants’ cultural activities. In terms of its origins, the Foundation was a comparative latecomer: it was not registered until 1977. Nevertheless, the Foundation’s capital keeps growing through personal donations, legacies and other income (Baltutis, 1983, pp.71-75). First registered in 1977, the Australian Lithuanian Foundation Inc. (ALF) has been serving the Lithuanian community ever since. Pictured: The ALF’s 2005 management committee. Mrs B. Staugaitis (Vice-President), Mr A. Simkus (President). Dr A. Butkus (Secretary), Mr R. Samsonas (member) and Mr A. Balbata (Treasurer). Among its activities, the Foundation has been financially assisting the Lithuanian Studies Society at the University of Tasmania, and is a major co-sponsor of the book from which this article is taken. Soon after their arrival in Australia, Lithuanian women formed highly effective self-help social service committees in Melbourne, Sydney, Adelaide and elsewhere. This was back in the days when the Australian government-run welfare services were still in the early stages (Baltutis, 1981, p.35). In 1975, the Lithuanian Women’s Welfare Association Inc. in Sydney built a village for elderly citizens (Baltutis, 1983, p.394). In the 1980s, the Lithuanian Women’s Association of South Australia Moteru Sekcija established hostel type accommodation for the elderly, incapacitated Lithuanians in Adelaide. These are mere examples; a complete list of self-help would be much longer. Kee (1989, quoted in Clyne, 1991, p.69) has found, for example, that the Lithuanians in Australia have recorded low unemployment rates, even lower than English-speaking monolinguals. One could try and argue that the indentured contract scheme was equally beneficial to Australia and to the Lithuanian migrants. One could say, for example, that Australia benefited because the migrants solved its acute labour shortage in key areas, while the migrants benefited, too, by being assured of jobs and having an opportunity to settle in a new country. This argument is difficult to sustain. Australia was the last country to enter the International Refugee Organization’s resettlement scheme and, political rhetoric aside, "economic expedience was by far the stronger motivation" (Panich, 1988, p.137). The Australian Government contributed only ten pounds ($20) towards each migrant’s fare. The rest of the passage was paid by various non-Australian welfare agencies. On arrival in Australia, all Lithuanian migrants were classified in only two occupations: labourers, which denoted all males, and domestics, which meant all females (Putnins, 1986, p.76). Although the Australian employment officials had full details of each immigrant’s skills and qualifications, no effort was made to match these with the jobs offering (Panich, 1988, p.119). The Australian authorities enforced labour contracts strictly. Klaassen (1997, p.158) mentions the first prosecution conducted in Adelaide in June 1949 when a migrant failed to fulfil his indenture contract. The migrant was sentenced to six months’ gaol and was deported after failing the dictation test. The cruel catch was that a dictation test of 50 words or more could be given in any language - usually a language that the accused was unlikely to speak or write (Palfreeman, 1958, pp.43-50; Yarwood, 1958). This incredible "test" was introduced in 1901 and existed in Australia for more than half a century. The early conditions for migrant settlement were inadequate. There was no family accommodation in many places to which contract workers were sent (Tarvydas, 1997, pp.27-31). Men had to live in tents or tin huts, in most primitive conditions. Their wives and children remained in holding camps such as Northam, W.A. and Woodside, S.A., for long periods and often a long distance away from their husbands’ and fathers’ work places. Marriages suffered, and the psychological scars of forced separations have remained for life (Panich, 1988, pp.117-122). 1. Study of the Lithuanian language, as an instrument of human communication (philology). 2. Lithuanian language, history and literature (along the lines of typical undergraduate foreign language programs in Australian universities). 3. Lithuanian linguistics (alone, or in combination with other linguistic studies). 4. The cultural aspects of the Lithuanian language and oral folklore. 5. Applied Lithuanian, such as Conversational Lithuanian, Business Lithuanian, Science Lithuanian, Lithuanian for Travellers. 6. Lithuanian studies: a broad range of disciplines concentrating on Lithuania and its people (e.g., history, law, environmental studies, sociology, geography, geology, etc.). All these topics may be studied in translation and do not necessarily require any knowledge of the Lithuanian language. When discussing Lithuanian Studies, we must therefore define what we mean by that name, in each case. For example: when Professor Karmel, Chairman of the Australian Universities Commission, called for community language submissions in 1980, he vaguely referred to "programs in community languages of two or three years in length" (Karmel, 1980, p.1). This seems to approximate the first definition in the list of definitions above. However, when Commonwealth Education Minister Fife subsequently announced the successful grants at the end of 1981, he talked of "courses of language and culture" - suggesting the fourth definition. On the other hand, the traditional method of teaching foreign languages in Australian universities matches the second definition. Similarly, the documents of the Lithuanian Studies Committee in Melbourne (to be discussed in a later part of this book) imply that this Committee had the second definition in mind when campaigning for the introduction of Lithuanian courses in 1980-1985. The syllabi of the two Lithuanian courses that did run in Australian universities for limited periods (cf. Chapters 6 and 7) were restricted to Linguistics, fitting the third definition. These examples illustrate the danger of ambiguity when the central concept is not defined, or is not understood, clearly. In the six definitions just quoted, Lithuanian Studies were shown to have different meanings in different contexts. By the same token, some flexibility may be necessary in certain cases, embracing more than one definition. The present study will take a very broad view of Lithuanian Studies and will demonstrate how diverse studies in many disciplines with a Lithuanian "flavour" can be brought together under the common umbrella of "Lithuanian Studies". It is difficult to define the "Lithuanian community in Australia", in tangible and statistical terms. An all-encompassing Federal organization named the Lithuanian Community in Australia was formed on 1 August 1950 (Kazokas, 1992, p.59; Baltutis, 1983, p.62). According to the Community’s original statutes, all ethnic Lithuanians and their families living permanently in Australia were automatically members of the Community. This meant that the Community could immediately claim 10,000 members, plus further additions from the births and marriages after the arrival of the original migrant intake. In the present author’s opinion, such ambit claim of membership was unrealistic. A considerable proportion of Lithuanian immigrants became immersed in the Australian population and did not participate in the Lithuanian Community’s activities. The exact number of such Community "dropouts" has not been measured or reliably estimated; but it could be as high as 50% or more. As a result, it may be argued that nobody has had the real mandate to speak for all the Lithuanian immigrants. As is the case with most ethnic groups in Australia, the federal Lithuanian Community leaders effectively represent only a portion of the Lithuanians in this country (cf. Sheehan, 1998, p.xi). The original Lithuanians who settled in Australia half a century ago are gradually dying out. The rise of the ageing Australian population aged 60 and over and born in Lithuania/Baltic States/Ukraine/USSR was estimated to be 23.8% in 1981-91 and -15.7% in 1991-2001 (Woden, Holton, Hugo & Sloan, 1990, p.48). Will the Lithuanian community in Australia grow or diminish in the twenty-first century? This is a difficult question to answer, because the Australian immigration patterns for each nationality depend on quite a few factors. In addition to the Australian governments' changing intake policies, Lithuanians are now coming to Australia in smaller numbers and for different reasons. Up to 1990, they were mainly refugees, trying to escape persecution. Since then, they have been attracted by better living conditions and family reunions The sudden change in external circumstances and world politics could not be predicted even two decades ago. (1) Academic discipline. A scholar studying unfamiliar subjects, such as the complex forms of Lithuanian grammar, folklore, ancient writings etc., develops a high degree of academic discipline and analytical skills (Chipman, 2001, pp.7-20). At the same time, such study should trigger the scholar’s academic curiosity, an endless thirst for seeking new knowledge. (2) The language. Lithuanian is noted for its extremely conservative and philologically complex grammatical forms. Its archaic features include seven cases still in use in nouns, pronouns, adjectives and numerals; with another three cases and the dual surviving in more limited contexts. A knowledge of Lithuanian is a "must" for any linguist who works in comparative Indo-European linguistics (Bammesberger, 2001, pp.5-13). Lithuanian is a popular stepping-stone to Sanskrit, which was first established as the basis for comparative language studies by Sir William Jones (Bammesberger, 2001, pp.6-7). (3) Elegance and beauty of sound. The Lithuanian language may be studied for the elegance of its multiple forms and for the beautiful sounds of variable stress diphthongs. This ties in with the recorded treasure of numerous Lithuanian folk songs: they continue to be sung by the newcomers in Australia (Rakauskas, 1999, pp.17-43). (4) Filling gaps in available knowledge. The contemporary concentration on high-demand university subjects has left gaps in the overall knowledge of history, sociology, law, music etc. An in-depth study of the Lithuanian disciplinary counterparts can supply some of the missing data, and shed new light on what humanity has since forgotten altogether (Sabaliauskas, 1993; Gimbutas, 1963). (5) Cultural and intellectual enrichment. “Since language and culture are inextricably linked, learning languages can contribute to cultural enrichment and intercultural understanding between members of different groups in several ways” (Lo Bianco, 1987, p.45). (6) Knowledge for its own sake. While the present public discussions tend to emphasize knowledge economy, there is still scope for discovering new intellectual horizons (Spender, 2001, pp.21-25). (7) Australian heritage. The Lithuanian culture was one of the many inputs into Australia’s multicultural heritage. A systematic study of any aspect of the Lithuanian culture is automatically the study of the Australian heritage, too (Cope, Castles & Kalantzis, 1991, pp.36-39). (8) Teacher training. Lithuanian is an approved Higher School Certificate subject in four Australian States. There are no facilities in Australia, at present, for training Lithuanian teachers at tertiary level (LSC, 1984, p.156). (9) An exclusive field of learning. Study of a rare subject, such as Lithuanian Studies, may give the student an exclusive “designer label” status (Chipman, 2001, pp.11-12). The literature dealing with second language learning generally lists several further justifications, as well; e.g., economic (vocations, foreign trade, tourism), equality (social justice) and external (Australia’s role in the world) (Lo Bianco, 1987, pp.44- 62). All the evidence suggests that many immigrants of Lithuanian origin in Australia have been, in the main, very keen to maintain their Lithuanian identity and culture. The need to preserve one's Lithuanian identity (lietuvybe) was stressed at every opportunity. Endogamy, that is, marrying inside the Lithuanian ethnic group, was "the right thing to do" (Vasta & Castles, 1996, p.153). Some post-war Lithuanian migrants joined the existing Australian Lithuanian Society in Sydney, when they first arrived in Australia. In 1950, this Society was expanded and re-organized into a Federal body to be known as the Australian Lithuanian Community from August 1, 1950 (Kazokas, 1992, p.59). According to the Community’s constitution, all Lithuanian nationals in Australia and their families automatically became members of the Community. The Community’s statutes called upon its members to develop their Lithuanian national identity and to work for the restoration of Lithuania’s independence (Straukas, 1983, p.13). Administratively, the Community was divided into geographical districts (apylinke) and some smaller units (seniunija). The Federal Executive, elected for a two-year term by a Council of delegates, ran the whole Community. For the first 20 years, the Federal Executive was located in Sydney. Commencing in 1971, its headquarters started rotating among the larger centres of Adelaide, Melbourne, Canberra and Sydney. The Australian Lithuanian Community, headed by its Federal Executive, concerned itself with many matters: publication of a weekly Lithuanian-language newspaper, Musu Pastoge, underwriting the production of some books, establishment of libraries, co-operation with other Lithuanian organizations (e.g., the Priests’ Secretariat), collaboration with the Baltic Council of Australia and with the Lithuanian World Community. In later years, especially in 1974-1978, the Community also engaged in political activism in Australia. Responsibility for the newspaper was transferred to a separate Lietuviu Bendruomenes Spaudos Sajunga (Lithuanian Community Publishing Society Limited) in November 1977 (Baltutis, 1983, p.63). There were many other Lithuanian organizations in Australia, ranging from Catholic parishes and Lithuanian Scouts to folk dancers, choirs and repertory groups. Some of these functioned under the auspices of the Australian Lithuanian Community, while others were quite separate and independent. One of these independent bodies, the Australian Lithuanian Cultural Foundation, was established in Melbourne in 1948. It had branches in Adelaide and Geelong. The Foundation’s aim was to prepare curricula for weekend schools, to collect books for Lithuanian libraries and to organize cultural events - locally, Australia-wide and internationally. Until it ceased functioning in 1961-1962, the Australian Lithuanian Cultural Foundation had successfully established Saturday schools at all larger centres. Volunteer teachers taught Lithuanian language, history and culture, as a supplementation to the normal curricula the children learnt in Australian schools during the week.. In 1962, the Australian Lithuanian Community set up its own Federal sub-committee for cultural matters, the Federal Cultural Council (Krasto Kulturos Taryba). Responsibility for Saturday schools was gradually taken over by the local branches of the Community (Kazokas, 1992, p.60). A separate funding structure, the Australian Lithuanian Foundation Inc., was established in Melbourne in 1972 and incorporated in 1977, to foster Lithuanian migrants’ cultural activities. The Foundation’s charter allows it to be active in many fields, but the Foundation tends to step in directly only when there is an obvious need that has not been met from other quarters (Baltutis, 1983, p.71). In March, 1971, the teaching of Lithuanian to senior schoolchildren in Melbourne moved from the self-help community school to the Victorian educational system. The Victorian Department of Education approved the syllabi and hired teachers. At the same time, the original community school continued teaching primary classes and the two-year advanced Lithuanian course. However, it took another four years and a lot of effort by Mr Petras Sungaila and other Lithuanian educationalists before H.S.C. Lithuanian was finally accepted as a matriculation subject by the Victorian authorities, similarly to other modern languages such as German and French. The Victorian Universities and Schools Examination Board initially examined interstate candidates in H.S.C. Lithuanian from South Australia and New South Wales. Later, those States established their own examination bodies for H.S.C. Lithuanian [Adelaide, 1978; Sydney, 1980] (Baltutis, 1983, p.282). These developments show why the establishment of university courses of Lithuanian Studies was considered to be important by community members. The present study has delved more deeply to examine the institutional factors that influenced the establishment and the cessation of Lithuanian courses in Australian universities. The book will identify the systemic reasons why Lithuanian syllabi are not taught as undergraduate courses in Australia today; and will offer a new model for the promotion of scholarship in Lithuanian Studies. The latter model can also serve as an alternative scheme for the maintenance of other low demand language and cultural studies in higher education. Many Lithuanian post-war immigrants had European professional qualifications, but their credentials were not recognised in Australia. On completion of their initial two-year Government contracts, these professionals had to make a choice: “go back to school” and qualify for the second time; or switch to another occupation; or leave Australia for good. Of those who remained, most were subsequently successful in creating jobs for themselves and for their employees or associates. Lithuanian dentist Stase Pacevicius (pictured left) had to enrol at the University of Adelaide and qualify again for her Dental Science degree. She then ran her own practice in South Australia for 25 years, employing two full-time dental nurse-assistants, one part-time receptionist and an accountant. She also constantly engaged the services of dental technicians and laboratories. 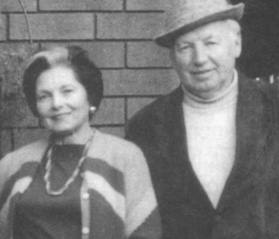 Her engineer husband Antanas Pacevicius (right) had to complete his two-year Australian Government’s contract by working as a manual labourer. He then found employment in his own profession, and later established a successful private building business in Adelaide. In addition to being self-employed, Antanas Pacevicius provided work for dozens of tradesmen and building sub-contractors, as well as an accountant and a real estate agent, over a period of 20 years. Published in 2005 by Tasmania University Union Lithuanian Studies Society, Post Office Box 777, Sandy Bay, Tas,, 7006, Australia. Tel. (03) 6225 2505. This book is copyright. Apart from any fair dealing for the purposes of private study, research, criticism or review as permitted under the Copyright Act, no part may be reproduced, stored in a retrieval system, or transmitted, in any form or by any means, electronic, mechanical, photocopying, recording or otherwise, without prior written permission. All enquiries are to be directed to the T.U.U. Lithuanian Studies Society at the University of Tasmania in Hobart. Copying for educational purposes. Where copies of part or the whole of the book are made in accordance with Part VB of the Copyright Act, the law requires that prescribed procedures be followed. For further information, contact the Copyright Agency Limited. Printed in Australia by Print Centre Tas Pty Ltd, Hobart. Phone (03) 6231 1700. LSS, PO Box 777, Sandy Bay, Tas. 7006. Australia. It is a well documented historical fact that the Lithuanians, together with the Latvians and the Estonians, were the first post-World-War-II non-British immigrants to Australia. Whilst they successfully integrated into Australian society, they also set about establishing their own communities and within them recreating all aspects of the rich Lithuanian culture they brought with them. Over the past 55 years or so Lithuanians in Australia have created an enormous body of literature ranging from poetry to carefully documenting their communities lives. However, when one surveys this out-put one is struck by a significant shortcoming. Almost all of it is in the Lithuanian language and, therefore, not readily accessible to Australians. Dr Taskunas’ book is a very welcome study not only for the challenging topic he analyses, but also because it is in English. Dr Taskunas’ study on the attempts, in various ways, to establish Lithuanian language courses at the tertiary level in Australia and the lessons which can be learnt from these experiences is timely. In spite of these persistent efforts Lithuanian is not only not taught at any university in Australia, but the teaching of our language, its literature and culture is now in decline at the secondary level. It may fairly be said that the teaching and study of Lithuanian in Australia is in crisis. By personal circumstances, education and career Dr Taskunas is ideally placed to tackle this problem. He was born in Lithuania where he spent his childhood. Dr Taskunas migrated to Australia in 1949, and has lived here ever since. He has spent much of his career at universities in Western these institutions; and he has observed over the years, with obvious interest, Australia and Tasmania, enabling him to appreciate the dynamics which drive the efforts to establish and maintain tertiary Lithuanian language courses in Australia. Whilst the book grew out of Dr Taskunas successful doctoral thesis upon the same subject, it cannot be regarded as purely “theoretical” or “academic”. The first chapter, in particular, provides a very useful and interesting introduction, punctuated by personal recollections, to Lithuanian migration to Australia and the Lithuanian contribution to the arts and sport in their adopted land. Although the book focuses on the teaching of the Lithuanian language, its relevance extends far beyond. I have no doubt that the issues it raises concerning the present scarcity of low-demand language courses in Australian universities and the conclusions it draws will provide stimulating reading to anyone interested in understanding the challenges facing many ethnic communities in Australia. Finally, this book must not be viewed as merely written by a migrant for migrants and, therefore, of little or no interest to purely English speaking Australians. Migrants from non-English speaking countries and their children permeate Australian society. By reading this book the reader, regardless of his or her ethnic background, will gain a deeper understanding of not only the struggles of the Lithuanian community, but the issues which face every ethnic community in Australia. I, therefore, commend the book as valuable reading to all Australians regardless of their background. The core components of this study were initially released as my Ph.D. thesis in the Faculty of Education of the University of Tasmania, in 2002. These original research results were subsequently updated, supplemented and shaped into the present book. Many people have helped me during this process: I am very much obliged to all of them. First of all, I am indebted to the supervisor of my original PhD thesis, Associate Professor Joan Abbott-Chapman who inspired me to seek new paths to knowledge and skilfully steered me all the way to my ultimate goals. She also offered extensive editorial advice throughout the book project. Many thanks for everything, Joan! I thank several first-hand participants in the past events who have helped me to close the gaps in the historical data, by providing documents and their first person accounts. They were: Dr Kristina Brazaitis, German Dept., University of Melbourne, Vic. ; Emeritus Professor E.C. Forsyth, Foundation Professor of French, La Trobe University, Vic. ; Dr Harold Koch, Australian National University, Canberra, A.C.T. ; Mr Vytas Patasius, Sydney; and Mr Petras Sungaila, Queensland. Others whose contribution is gratefully acknowledged in preparing this book are: Mr Glen Barwick, Mr Simon Bell and the staff of the Print Centre Hobart, Dr Aldona Butkus, Dr Kate Crowley, Mrs Louise Darko, Dr Bruce W. Davis, Professor Carey Denholm, Emeritus Professor Vytautas Doniela, Mrs Nilar Hlaing, Mrs Laima Jomantas, Rev Fr Greg Jordan SJ, Mrs Giedre Kaladiene, Mrs Nina Kantvilas, Dr Genovaite Kazokas, Mr Bruce King, Mr David McGregor, Mrs Dianne MacKay, Mr Vic Martisius, Mr Ervins Miezitis, Mrs Aldona Nunez, Professor Jan Pakulski, Mrs Grazina Pranauskas, Mrs Vingra Rupinskiene, Mrs Nijole Salkunas, Drs Peter and Giedre van den Dungen, Professor John Williamson, Dr Ramutis and Mrs Ramona Ratas Zakarevicius. I thank my Ph.D. examiners, Professor Trevor G. Fennell (Flinders University of South Australia) and Professor Violeta Kelertas (University of Illinois, Chicago, U.S.A.) for their assessment of my research and for their encouragement to publish. I am also grateful to Associate Professor Marcus Haward, Head of the School of Government at the University of Tasmania, and Professor Aynsley Kellow of the same School, for providing the facilities for Lithuanian research and for accommodating the Lithuanian Library within the School of Government. This has been a great help to me and to other scholars working in this area. I thank all members, past and present, of the Lithuanian Studies Society at the University of Tasmania, and Lithuanian communities in Australia and overseas who have encouraged my research over a decade. This work celebrates their heritage. Last but not least, my wife Trishie and our four children Millie, Anne, Vince and Simon have stood by me, have helped me and encouraged me right through the long years of this research. Words cannot express my gratitude to them, but I want them to know that I have appreciated their loyalty and love very much. While many people were involved in ensuring the successful outcome of this book, any errors, omissions or differences in interpretation are entirely the responsibility of the author. This book could not have been published, without the substantial financial assistance received from three sponsors: Australian Lithuanian Foundation, Melbourne (Mr Algis Simkus, Chairman); Canberra Lithuanian Community, Inc. (Mr Viktoras Martisius, Chairman); and Dr Stase Pacevicius, of South Australia. I thank all these sponsors most sincerely. Dr Pacevicius made her donation in memory of her late husband, Antanas Pacevicius, who was a great achiever in the engineering profession and in training tradesmen for the building industry. Algimantas P. Taskunas, OAM, Ph.D.